The 18.0 megapixel Canon Rebel T6 (1300d) is the latest low cost (entry level) DSLR from Canon which shares many of the features of more expensive DSLRs. The T6 is the follow on to the popular Rebel T5. Its HD movie mode can shoot Full HD Video with manual exposure. Dedicated Live View/Movie Recording button. The new feature uses Canon’s new STM lenses with silent autofocus. HDMI port to hookup to an HDTV. Large high resolution 3-inch LCD screen (920k pixels). 3.0 fps continuous shooting. Use the large LCD with the Live View Function for composition of both pictures and video. Dedicated Live View/Movie shooting button. You can capture a still image while shooting a movie. EOS Dust Removal System removes dust from the sensor automatically. Includes the 18-135mm STM (IS) Lens. Canon Rebel T6 Features: Built-in stereo microphones, native ISO 6400, 9 AF Points, Burst mode 3.0 fps, DIGIC 4+ chip, 18 megapixel CMOS AF sensor. Dedicated liveview & movie button. Video Snapshot lets you capture short 2, 4, or 8-second video clips. Built-in WiFi & NFC will pair the T6 with a smartphone or tablet to wirelessly share photos and videos. WiFi will also allow you to wirelessly remote control your camera. Shutter speeds: 30 – 1/4000 second, ISO: from 100-6400, Extended ISO to 12800, Burst Mode: 3.0 fps, Built-in Flash. Memory Cards: Uses SD, SDHC, UHS-I and SDXC cards. Lithium-ion battery LP-E17 (included). USB 2.0. Dimensions: 5.1″ x 4.0″ x 3.1″ (17.1 ounces body only). Smart-Review Commentary: For 2016, The entry level Canon Rebel T6 is the lowest cost DSLR entry by Canon in 2016. 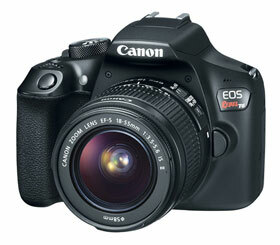 It has many of the features of DSLRs with higher prices, and is a solid beginner’s DSLR Camera. The Canon T6 has an improved Full HD movie mode, which uses contrast-type AF during Live View and video shooting. This DSLR requires lenses with an Autofocus motor for autofocus to work, these lenses are AF-S lenses. The new STM AF-S lenses have an almost silent autofocus. The video records sound using its built-in stereo microphone. This model does not have an external microphone jack, upgrade to the T6i to get this option to use external microphones. The CMOS sensor gives you 18.0 megapixels and low light sensitivity with a native ISO of 100-6400. The T6 includes WiFi & NFC to share your pictures and video, and to also control your DSLR remotely. This is one of the lowest priced options in DSLRs. It is a Smart-Review top pick. Memory Cards: If you are going to record 1080p video on your T6, for best results we recommend Class 10 SDHC memory cards that record at 30mb/s and higher. Canon Rebel T6 Lens Compatibility: The Rebel T6 is compatible with over 60 EF and EF-S lenses. The EF-S lenses are specifically designed for APS-C imager SLRs such as the T6. APS-C SLRs have a focal length conversion factor of 1.6 compared to full frame SLRs. The T6 DSLR requires lenses with autofocus motors, for autofocus to function in this camera.